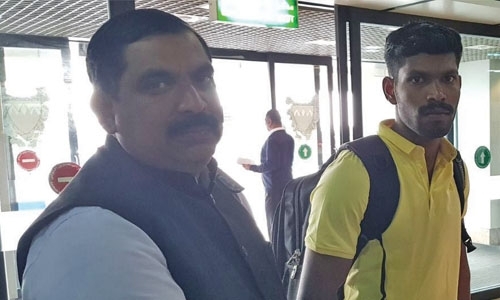 Manama: The prime accused in a sensational murder case was taken to the Indian state of Kerala yesterday after admitting to the crime that he committed during the vacation. Following a tip-off after the arrest of his two accomplices in Kerala this week, his employer and social workers here confronted Arun Karunakaran, 28, accused of slashing the throat of P.V Janaki, 66, a retired schoolteacher. After misleading the police and public by joining search operations and by participating in protest meetings to find the killers, Arun returned to Bahrain on Feb 4. He has been working here for two years. The murder committed on the night of December 13 in the sleepy North Kerala village of Cheemeni kept the police on their toes with the investigation stretching to other Indian states, analyzing thousands on mobile calls and interrogating scores of suspects. The trio was unmasked after the father of one of the accused, found bills of the sold jewellery in his house. The father, a street hawker, found it suspicious and informed the police. All three accused are from disadvantaged families, and the plan to rob was hatched when Arun arrived from Bahrain on vacation. The accused, all neighbours of the victim, robbed money and jewellery after killing her and hurting her 85-year-old husband on a night when the village was celebrating the annual temple festival. The night was chosen to mislead the police as people from far and wide, including migrant labourers, reach the village. The robbery plan by the masked men became a murder after victim Janaki recognized her students, the husband told the police. The suspects waited for more than a month before attempting to sell the jewellery in distant towns in Kerala and Karnataka after which Arun flew back to Bahrain and joined work as if nothing had happened. Sources in Bahrain told that the accused was calm when confronted with the news. Following a police tip-off from Kerala, social worker Subair Kannur talked to the accused who confessed to the crime. Subair Kannur travelled with him to Kerala where he was handed over to the police.